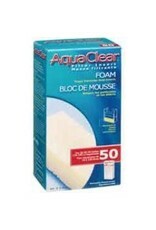 Aquaria Aqua Clear 50 Foam Insert-V - Rick's Pet Stores Inc.
AquaClear 50 Foam Filter Insert is a mechanical filter media that effectively removes particles and debris from aquarium water. It also prevents particulate waste from prematurely clogging other media in the filter. Primarily a mechanical filtration media, it also provides powerful biological filtration as friendly bacteria eventually grow inside its pore structure. 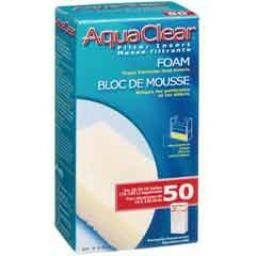 Exclusively designed for the AquaClear 50 Power Filter, the Foam Filter is safe for fresh and saltwater aquariums. Single pack.